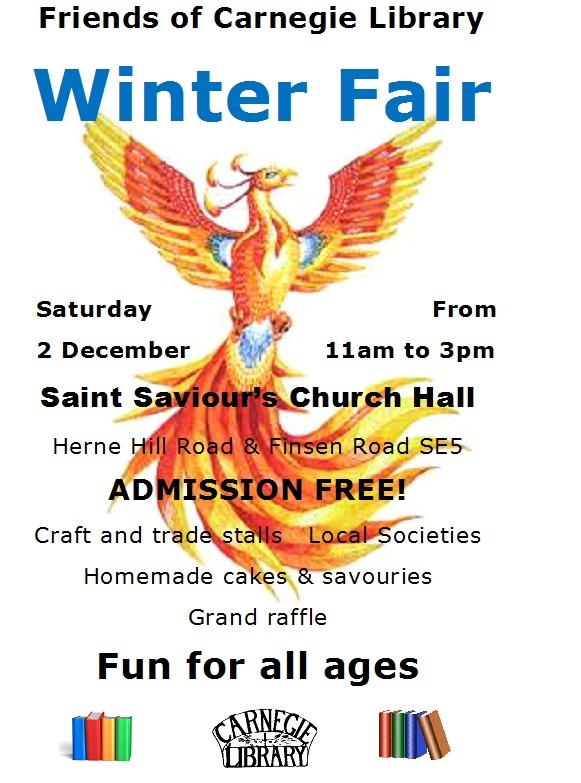 For the second year running, we are holding our Winter Fair in exile. From 1999 to 2015, the fair, spread over the public library rooms, grew to become the most popular one around, an unmissible event for people of all ages. With the library closed, we are continuing to stage a fun day for all, to show we are still here. This year we will be in St Saviour’s Church Hall on Saturday 2 December, open from 11.00 – 3.00, with an array of community stalls, craft stalls, a raffle, refreshments, activities for children and a few surprises. Come along and show your support for our campaign to reopen Carnegie Library, not as a diminished so-called ‘neighbourhood library’ but with full service. We understand St Saviour’s roof is in need of repair. This may restict our space a bit; but we will make the most of it. The lovely 1914 arts & crafts building was listed Grade II the same year (1981) as the library.